The Metropolitan Washington Airports Authority Board is due to vote Wednesday to raise the mainline plaza rate from $2.50 to $3.25 and ramp rates from $1 to $1.50, effective Jan. 1. WASHINGTON — Dulles Toll Road rate increases are set to be approved in a final vote this week. The Metropolitan Washington Airports Authority Board is due to vote Wednesday to raise the mainline plaza rate from $2.50 to $3.25 and ramp rates from $1 to $1.50, effective Jan. 1. For larger vehicles, tolls would range from $6.50 to $10.25 at the mainline plaza and $3 to $4.50 at ramps, depending on the number of axles. The draft resolution would reserve the right to make additional toll changes sometime before the end of 2020 at specific ramps, which could include reducing the toll rate at Spring Hill Road or imposing tolls at the not tolled Route 7 ramps, to limit the number of drivers attempting to get around paying. The resolution tracks the version of the toll rate hike plan unveiled last month. An advisory committee has also asked for continued efforts to find additional funding sources to pay for construction or financing of the Silver Line to limit future toll increases. This is the first toll increase since 2014, under an agreement to freeze increases before tolls rose again to continue funding Silver Line construction. The rail line is now expected to open in mid to late 2020. A federal appeals court in Richmond, Virginia, affirmed last month the dismissal of a lawsuit challenging the use of the tolls to help pay for the rail line’s construction. The next general Dulles Toll Road rate increase is expected in 2023, when tolls are planned to jump to $4 at the mainline plaza and $2 at ramps. Ramp tolls are also charged at the entrance and exit to the privately-owned Dulles Greenway. In July, August and September, the Greenway owners reported average daily toll revenue of $247,846, down about 2 percent from the previous year. Average daily use of the Greenway dropped about 4.7 percent to 50,174 per day as many drivers chose other routes or took fewer trips overall. On Transurban’s 95 and 495 Express Lanes, the number of trips also declined in July, August and September, compared to the same period last year. In the 95 Express Lanes, average daily trips dropped 0.4 percent to about 51,000. The average toll price paid increased slightly to $8.40. In the 495 Express Lanes, the average toll price paid rose 3.2 percent to $5.35, even as average daily trips dropped 1.2 percent to about 47,000. Greenway tolls are currently $4.65 in off-hours and $5.65 at rush hour, and state law allows the tolls to be raised each year through 2020. The additional ramp toll for access to the Dulles Toll Road goes to the Airports Authority. 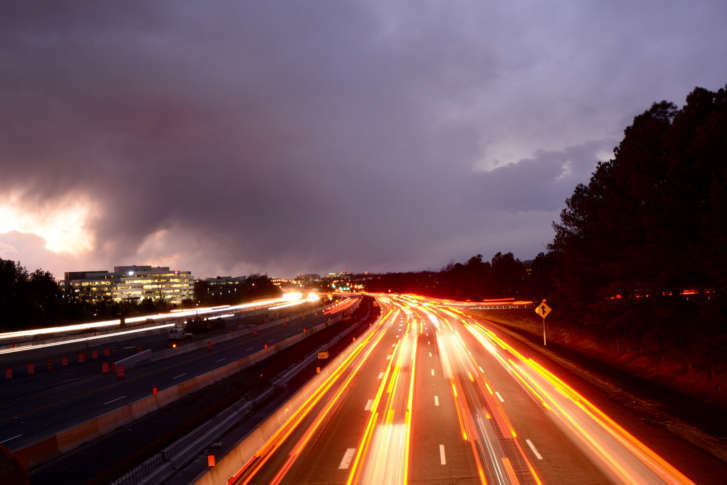 With that included, the Dulles Toll Road has collected $127.2 million this year as of the end of October. That is down 0.5 percent from the same point last year and 1.5 percent below forecast. There have been 81 million transactions at the ramps or mainline toll plazas, down 0.8 percent from the same point last year and 2.2 percent below forecast. Next year, with the toll increase, the Airports Authority expects to collect more than $200 million. Nearly 90 percent of all money paid on the road is through E-ZPass rather than cash. Toll violation revenue this year is up to $3.7 million through end of October, about $500,000 more than at the same point last year. Each violation comes with bills for at least $50 plus the missed toll cost and administrative fees.